HAGERSTOWN, MD (April 10, 2019) – The Hagerstown Suns, in conjunction with TV10 WRNR, are excited to announce a partnership for the 2019 season. The Suns will broadcast select home games as a “TV10 Game of the Week” on TV10 WRNR, including the Home Opener tomorrow against Asheville at 5:50 p.m. In April, two games will be broadcast on WRNR. April 11 versus the Asheville Tourists, beginning at 5:50 p.m. and April 25 versus the Greensboro Grasshoppers beginning at 5:50 p.m. The Suns 2019 broadcast crew, John Kocsis, Director of Broadcasting and Media Relations, and Ray Jensen will broadcast the games on TV 10 WRNR. 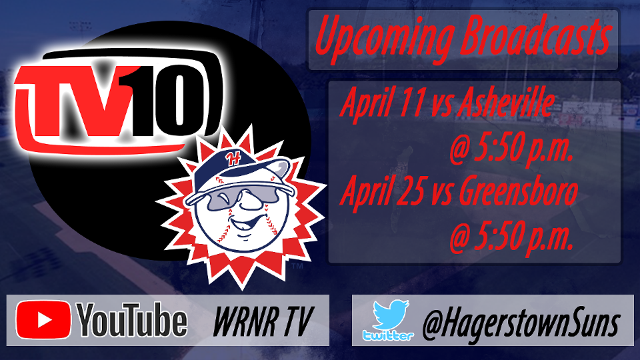 In addition to the TV10 Games of the Week, fans can tune into the online stream at Hagerstownsuns.com and on the TunedIn Radio app for all 70 2019 home games and select road games throughout the year. For tickets and more information visit hagerstownsuns.com or call 301-791-6066.